We have found a real bingo gem! Bingo Diamond has a wide variety of games from 75 & 90 Ball Bingo, 3 Reel & 5 Reel Slots and other fantastic games. With weekly and monthly promotions, as well as the Big £10 000 guaranteed prize game that takes place every month, there is something for everyone. If you are looking to put the sparkle back into your bingo life then this is the place to play. Bingo Diamond offers the most entertaining 75 and 90 ball bingo games around, along with speed and free bingo. The other great features are the fun chat games, friendly online community and some of the best slots on the net. The most popular slot games include Immortal Romance, Gold Factory, Mermaids Millions, Thunderstruck and Lord of the Rings. They like to keep it new and exciting so you can look forward to new slots games and features added every month. Get started with the bingo fun and win, with a fantastic special offer for new a member that gives you $15 free to try the games (no deposit required). As a fully-fledged member of the Bingo Diamond community, you get a re-load bonus of 50% back on every deposit you make. So register your account today and enjoy these incredible offers. 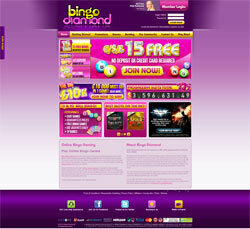 Bingo Diamond is operated by the Diamond Gaming Group Ltd, and operates the latest Microgaming Software. Diamond Gaming Group Ltd is licensed by the Lotteries and Gaming Authority of Malta. The support teams are on hand to answer any of your questions 24/7. Should you require any assistance then please don’t hesitate to contact their friendly team via email or live chat via the lobby or website.